9As they were coming down the mountain, he ordered them to tell no one about what they had seen, until after the Son of Man had risen from the dead. Well, the Gospel writers certainly have their work cut out for them this time, don’t they? It was already difficult enough to describe the scene when Jesus walks across water or uses a few fish and loaves to feed the multitudes. But now, the writers face one of their greatest struggles. They seek to place us there alongside Peter, James, and John, who themselves must have had great difficulty describing this bizarre experience once they were released from their order to remain silent. And even that order—“tell no one about what they had seen, until after the Son of Man had risen from the dead”— is a strange order, in and of itself. The trio must have wondered if they would ever be able to share the news of all they had seen on that mountaintop. And even if they did, how could they hope to describe it? And yet, weird as this story is, the writer of Mark is determined for us to be there. Faced with the daunting challenge of describing the indescribable, the Gospel writer focuses on one particular detail in describing Jesus’ Transfiguration. As the disciples look upon their teacher, they see his clothes become whiter than the whitest white. Surely, there must have been much more to this experience, but the writer boldly pushes ahead, having determined that there is no point in trying to unveil the mystery, when words simply won’t do. But as we see, this is the sort of story where pushing past one mystery only leads right into another. As the disciples look to their Transfigured Lord, two great figures of their faith also became visible. The writer never explains how the disciples are able to recognize the figures talking with Jesus. Could they have been wearing nametags saying, “Hi! My name is Moses”? Or did they pass out business cards reading something to the effect of “Elijah: Prophet of the Most High”? Despite our lingering questions, the Gospel writer pushes forward. If nothing else, the unusual offer of Peter to build dwellings for Jesus, Moses, and Elijah suggests that, even in the moment, the disciples themselves are unsure what is going on. As their eyes seek to take in the glorious scene that is revealed in the light that radiates from their Master, the disciples struggle to understand the appropriate response. If Jesus selected the three of them to share in witnessing to this incredible event, surely he must have had a reason. But what could it be? How were they expected to answer? And yet, while the disciples struggle to comprehend one experience, the Gospel writer moves us forward into yet another unusual occurrence. From a cloud overhead, there comes a voice, which proclaims, “This is my Son, the Beloved; listen to him!” At this point, we who have read or heard this story from the beginning actually have an advantage over the disciples who were not present with Jesus at his baptism. It was there that we first encountered this voice which spoke to Jesus, saying, “You are my Son, the Beloved; with you I am well pleased.” (Mark 1:11) But now, in order to share with the disciples what we already have heard, the voice proclaims that Jesus is the Son of God. And with this announcement, there also comes an order: “Listen to him!” And with this, the inexplicable moment is over. There is no more vision of the Transfiguration, no further congress with the ancient figures of their faith, no more voices coming from clouds. Now, there is only Jesus. So now, as we come back down from the mountain alongside the disciples, we are left wondering, “What was all of that about, anyway?” But even as we ponder these things, our descent leads us down back into the darkness of our present reality. With each footstep, we are brought back from the beauty of a moment that we can’t explain into the horror of the reality we cannot avoid. 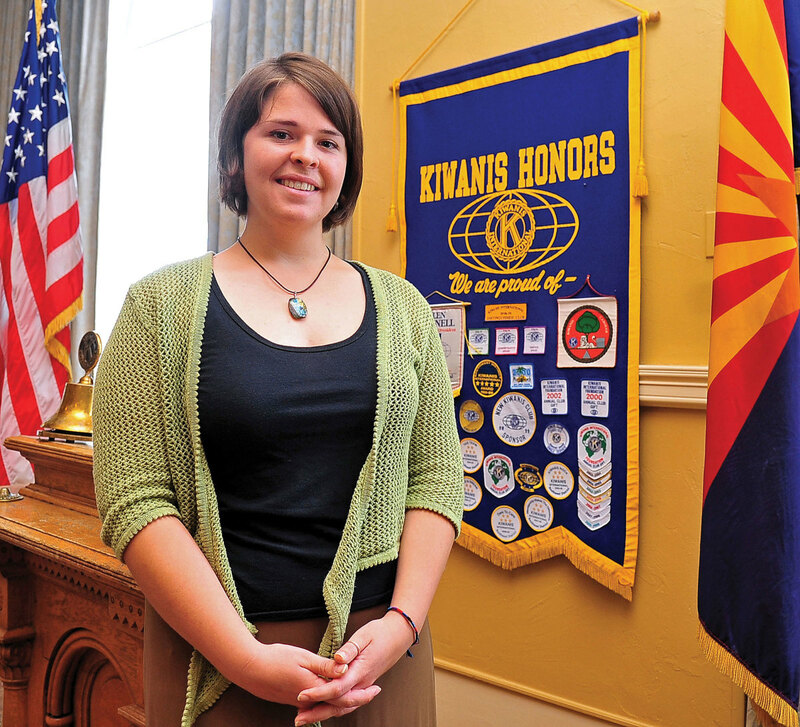 In May of 2013, Kayla Mueller spoke before the Kiwanis Club of Prescott Arizona about her work with Syrian refugees. For me, this darkness came this week as I was challenged to write about the light of Christ in the Transfiguration, while at the same time facing tragic news reports of the loss of the lives of several young adults. After days of speculation, it was confirmed that twenty-six year old Kayla Mueller had been killed in Syria. [i] The coverage that followed seemed to center on whether her death had come directly at the hands of her captors or as a result of an airstrike carried out by counterinsurgent forces. While pundits debated this question, I was left with a mystery of my own. Why is it that Kayla’s death brings us such sadness and yet the deaths of innumerable Syrian and Iraqi innocents is almost accepted as a part of the world in which we live? But even as I struggled with this question, there was hardly time to consider an answer. There came another report much closer to home. Early on Wednesday morning, Chapel Hill police responded to a shooting in which three young adults between the ages of 19 and 23 were killed. [ii] The victims, Deah Barakat, his wife, Yusor Abu-Salha, and her sister, Razan Abu-Salha were all students at nearby schools. They were all also Muslim. The preliminary assumption was that the assailant had killed them because of their faith. And to this point, members of the victims’ families maintain that this was a religiously motivated hate crime. However, much to the relief of many people, investigators now seem to be leaning toward the theory that the deaths of these three young people were the result of a rage-filled response to an ongoing dispute over a parking space. And yet, I was left to wonder, why did this change in motive bring comfort to so many? How could we be more at ease with the idea that these three lives were lost over a parking space, rather than over hatred or fear of their religious identity? And as I’ve since thought about the deaths of these four young people, who are admittedly just a couple of the more recent high-profile examples to choose from, I came to a single conclusion. Our eyes are sore. Our eyes were designed by God to look upon a beautiful, bright Creation. They were intended to reveal the majesty of the Lord’s work reflected in everyone and everything we see. God never designed our eyes to adjust to the darkness in which we now find ourselves. Day after day, we struggle to look at this dimly lit world and to process what we see. The inexplicable death at the hands of one another is perhaps the most egregious example. But there are many more sights that we can scarcely absorb. We struggle with visions of children who are starving in a world where there is an abundance of food and images of babies dying from easily preventable diseases. It is here that the Transfigured Christ appears when we need him most. In this moment of mystery, the one thing we can see is the light does not merely illuminate our Lord. Rather, Jesus is the light through which the world as God intended is revealed. In that moment, shared only with the three disciples, Jesus gives them a glimpse of what is to come. When seen by the light of Jesus, the world is going to be a very different place. But that is a fleeting assurance for those of us whose eyes still hurt. As we wait for the coming of our Lord in the fullness of his radiance, what are we to do? This question probably challenges us to live into the greatest of all the mysteries of the Transfiguration. How do we move from being mere witnesses to the Transfiguration to active members of the experience? As the disciples come down from the mountain, they are cautioned not to tell anyone of what they have seen. The news must not be shared until Christ has completed his ministry. But the Good News is that Christ is risen! And now, we like Peter, James, and John are free to witness to the moment of Transfiguration. It doesn’t mean that Creation has been restored and that the brokenness of our world is past. Instead, it means that we can carry forth the light of Christ, which reveals the world as God intended. 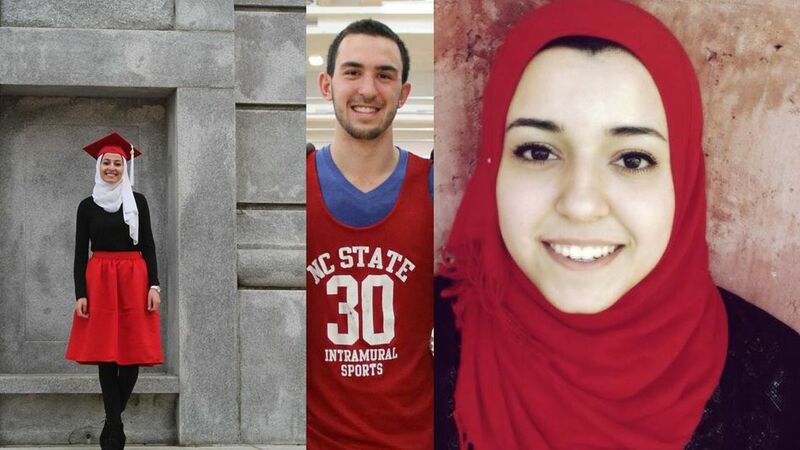 Pictured from Left to Right: Yusor Mohammad Abu-Salha, 21, planned to enter the UNC School of Dentistry in the fall; Deah Barakat, 23, was the husband of Yusor and a student at the UNC School of Dentistry; Razan Mohammad Abu-Salha, 19, was the sister of Yusor and a student in architecture and environmental design at North Carolina State University. In this light, I not only see the sadness of Kayla Mueller’s death, but I also am witness to the glory revealed in the life of someone who was a bold advocate and dedicated servant for the refugees of the violence in Syria. [iii] In Deah Barakat, I don’t just see a young man who lost his life in an act of senseless violence, I see someone who openly decried atrocities carried out in the name of any person’s religion. [iv] Even as we look at the brokenness of this world, the mystery of the Transfiguration challenges us to open our long-aching eyes and to dare to see the world as God has created it. In this newly illuminated world, we don’t just face the dark sights of hunger and poverty, illness and ignorance, violence and separation. Instead, by the light of Christ, we see something new happening. We who carry this light are now able to see the way forward to a place where the hungry are fed, the sick are healed, conflicts cease, and all share in the bounty of the Kingdom. As Christ was transfigured before us, we now have been transfigured, so that we might become the light of Christ. So Friends, today may not be the day when all of our questions are answered. It may be a day in which we are challenged to live in the presence of mystery. But the Good News that we must go forth to share with the world is that Jesus Christ is indeed “a sight for sore eyes!” And as we go, may we give thanks for the continuation of this mystery. And may we also carry with us the certainty that the light that shines forth from him, now shines forth from each of us too! This sermon was delivered at Bowling Green Presbyterian Church on Sunday, February 15, 2015 (The Transfiguration of the Lord). This entry was posted in Sermons and tagged transfiguration. Bookmark the permalink.